Perhaps it’s a commentary on the rising popularity of 360-degree cameras. Cheap 360-degree cameras are now being sold on eBay. This one, called the Cube 360, looks like the Kodak SP360. Like the SP360, it has a hemispherical design (360 x 180) with a claimed aperture of f/2. 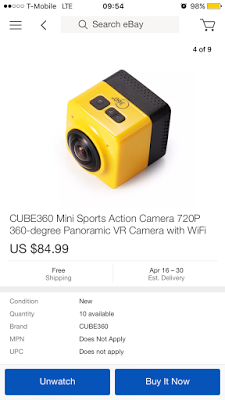 It’s called a “Mini Sports Action Camera” but unlike the SP360, has no lens protection cover. While the SP360 has a resolution of 16 megapixels, this one has a resolution of 1280 x 1042 (around 1.3 megapixels), which might refer to video resolution. It does offer WiFi, although I don’t know if that means connectivity with a smartphone, or just a desktop. The price: just $85 with free shipping. There is another cheap 360 degree camera with a slightly different design and better specs. This one seems to be called the “X360,” and costs a little more at just a shade under $100, but has several interesting features. The resolution is claimed to be 12 megapixels (3472 x 3472). It seems the image can be saved in several projections called round, 180 panorama and 360 panorama, “4 in 1,” “3 in 1,” and “2 in 1.” The video resolution is 1392 x 1392 at 30 fps in H.264 AVI. The X360 has a self-timer, burst mode (3, 5, or 10 images), timelapse mode and a “loop record” mode, which I am guessing means that it will record to a buffer that is continuously being overwritten to keep only the most recent video, of either 1, 3, or 5 minutes. It also has HDR mode and a motion detection mode. There is a function called “GSensor” with settings for Level1 to Level4. It might refer to electronic stabilization but I’m purely speculating. 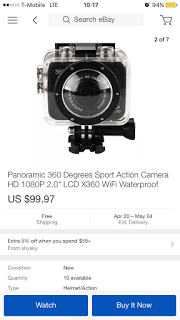 It has a waterproof enclosure that resembles GoPro’s. The enclosure seems like it could offer protection from dust as well. 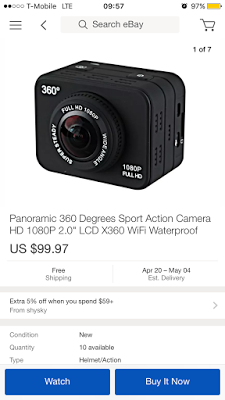 These cameras may appeal to potential customers who are intrigued by 360 photos or videos but don’t want to spend more than $100, or for photographers looking for a semi-disposable 360 camera to be used in risky situations.